Bring color and fashion to your home with Owens Corning’s new Duration® Shingles Designer Colors Collection with SureNail® Technology. The brilliantly colored granules will add curb appeal and make your customers’ homes stand out, and position you as a design leader in your market. But that’s not all: backed by one of the best warranties in the business, these shingles come with the attributes you have come to expect, with 110-MPH Wind Resistance Limited Warranty, a 30-Year Limited Warranty, a Wind Resistance Warranty, and Algae Resistance Limited Warranty. The Designer Colors Collection offers seven new colors modeled after those found in life, and are meant to evoke feelings that match their names—from Summer Harvest, Pacific Wave, to Merlot. Summer Harvest, for example, is a blend of sunny gold, cool blue and burnt sienna tones that blend to achieve a warm, rustic feel much like a summer day with a clear blue sky. Five of the seven colors are available in each region of the U.S.
GAF-Elk’s quality roofing products have been designed to work together for superior, long-term protection, and have been proven on literally millions of homes nationwide. They even carry the prestigious Good Housekeeping Seal—your assurance of exceptional quality and performance! 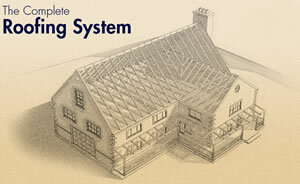 To learn more about the components that make up a superior roofing system, just click on any of the categories below. Contact Us Today! < Browse Shingles! CertainTeed Corporation is a leading North American manufacturer of building materials including roofing, vinyl and fiber cement siding, trim, fence, railing, decking, foundations, insulation, gypsum, ceilings, and pipe products. Headquartered in Valley Forge, Pennsylvania, CertainTeed has approximately 7,000 employees and 70 facilities throughout the United States and Canada. Through its Vision, Mission, Values and Objectives (VMVO) initiative, CertainTeed strives to be the preferred choice for innovative building products and systems by delivering a superior Customer experience to a broader market through the development of exceptional team performance and world-class processes. CertainTeed is a subsidiary of Saint-Gobain, one of the top 100 industrial companies in the world. Saint-Gobain employs approximately 22,000 people in North America and more that 206,000 people in 57 countries world-wide. Saint-Gobain’s North American companies operate nearly 200 manufacturing facilities in industries as diverse as industrial ceramics and containers, reinforcements and flat glass, abrasives, and building materials. Contact Us Today! Browse Shingles! 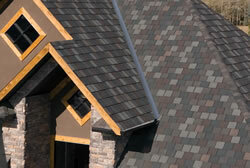 IKO manufactures a full line of asphalt roofing shingles. 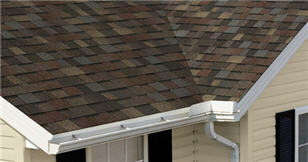 These shingles feature fiberglass mats and are available in several popular styles in a variety of colors. Hankins Homescapes also sets the standard by offering one of the most respected names in the roofing industry. IKO shingles are sought after for styles and popular colors in roof shingles, and they are known for industry-leading quality. We use our buying power and long standing relationship with IKO to offer very competitive pricing on IKO roof shingles. IKO’s premium architectural shingle provides durability, low maintenance and the great looks of a shake-like appearance at a very attractive price. They’re built to last with double-layer construction and a tough, modified sealant for superior tear strength values and greater resistance to high winds.